Targeting Indians yet again, The Taliban today carried out coordinated suicide attacks at two hotels in Kabul, killing at least nine Indians, including two Major-rank Army officers, evoking sharp reactions from India. 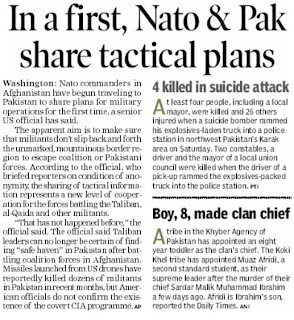 At least 10 others, including five Indian Army officers, were injured in the strike that killed eight others, including locals and nationals from other countries. 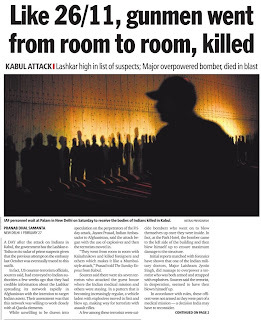 The bombers, believed to be three in number, struck at the guest houses, particularly at Park Residence, rented out by the Indian embassy for its staffers and those linked to India’s developmental work in Afghanistan. External Affairs Minister SM Krishna said as per the preliminary information provided by Afghan government officials, “up to nine Indians... have lost their lives”. “A few Indians have been injured, most of whom are reported to be out of danger. Arrangements are being made for their adequate and expeditious treatment, if necessary, by evacuating them to India,” he said in a statement. Sources in the Indian Embassy in Kabul said that only six Indians were confirmed dead. Krishna asserted that the attack would not deter India from pursuing developmental activities and would stand by the Afghans in the common fight against terrorism. Krishna, who received a telephone call tonight from his Afghan counterpart Zalmay Rassoul, said the “barbaric” attacks were clearly aimed against the people of India and Afghanistan. Describing it as a matter of concern, he said, “These are the handiwork of those who are desperate to undermine the friendship between India and Afghanistan, and do not wish to see a strong, democratic and pluralistic Afghanistan.” The Taliban claimed responsibility for the attack in telephone calls made to some foreign news wires. This is the fourth attack targeted at Indians in Kabul since July 2008 when 60 people, including four Indian embassy officials, were killed in a massive car bomb attack on the embassy building. Strongly condemning the attack, Afghan President Hamid Karzai said it would not be allowed to hurt Afghan-Indian relations. “Attacks on Indian citizens will not affect relations between India and Afghanistan,” he said. A mysterious parcel with pieces of detonator was received by the office of Director General Border Security Force today setting alarm bells ringing in the security machinery here. The parcel sent through a private courier company based in Sonepat, Haryana, was received in the CGO complex office here at 12.30 pm and sent the staff into a tizzy. It carried a book having a cavity in which pieces of detonators were detected. However, no explosives were found in it. Showing presence of mind, the staff immediately informed the Delhi police that rushed its bomb squad to the spot along with sniffer dogs, souces said. Director General Raman Srivastava is on tour to Meghalaya border today. The police has arrested the courier boy who delivered the parcel and the address of the courier company is being verified, they added. Allocations for all paramilitary forces except the NSG and ITBP have been decreased in the budget with cuts ranging from 6 to 16 per cent. The largest paramilitary Central Reserve Police Force (CRPF) with almost 2.50 lakh personnel has been allocated Rs 5745.87 crore under the demands for grants head which is a decline of about 16 per cent from last year's Rs 6838.84 crore to the force, which is largely involved in anti-naxal and counter-insurgency operations in the country. The National Security Guard (NSG), which played the lead role in ending the terror siege during 26/11 Mumbai attacks, has been allocated Rs 352.58 crore, an increase of 10 per cent from the previous Rs 320.63 crore in the budget presented by Finance Minister Pranab Mukherjee. The other force to get an increased allocation is the Indo-Tibetan Border Police (ITBP), guarding the crucial Sino-Indian border, at Rs 1520.11 crore for the next fiscal, a bit higher than last fiscal's Rs 1508.94 crore. The Central Industrial Security Force (CISF), which guards the country's 57 airports and vital installations, has been earmarked Rs 2022.18 crore as compared to Rs 2244.36 last year. The Sashastra Seema Bal (SSB) guarding the Indo-Nepal and Indo-Bhutan borders has been sanctioned Rs 1294.75 crore, almost a hundred crore less from last year's allocation of Rs 1394.97 crore. The Assam Rifles has been allocated Rs 2014.53 crore for the next financial year in comparison to Rs 2168.20 crore during 2009-10. The Border Security Force (BSF), guarding the country's border with Pakistan and Bangladesh, has been allocated Rs 5471.33 crore as compared to Rs 6329.14 crore during the last fiscal. Last week in the Committee on Disarmament (CD) in Geneva, the Pakistani delegate made an elaborate statement on Pakistan’s objections for the CD taking up for consideration of the issue of Fissile Materials Cut-off Treaty (FMCT). He opposed the move and argued that the treaty, as it is formulated will affect Pakistan’s security. In his view, the issue cannot be considered in isolation independent of other developments in South Asia. He launched a vitriolic attack on India for triggering an arms race in South Asia. But his main focus was on the waiver of the Nuclear Suppliers Group’s guidelines in favour of India in respect of civil nuclear cooperation. He cited some US experts to support his view that it will enable India to save its own uranium for weapon purposes and that the Indo-US nuclear deal was damaging the Non-Proliferation Treaty (NPT). According to him, the Indian nuclear submarine programmed, ballistic missile programme and anti-ballistic missile programme were all making an arms race in South Asia inevitable. Though the Pakistani delegate made his speech an attack on India, it was a criticism of the major powers of the world who took the initiative to get India the NSG waiver and a criticism of the 45-member NSG for having extended to India this waiver. Though he denied that Pakistan was isolated on the issue the fact that the 45-member NSG group gave India the waiver and not to Pakistan speaks for itself. In March 2006, when President George Bush stopped at Islamabad on his way back from New Delhi, General Musharraf raised the issue of Pakistan getting a civil-nuclear cooperation agreement analogous to India’s in public before the TV cameras. President Bush replied that Pakistan was different, its needs were different and its history was different. The last sentence that Pakistan’s history was different explained the whole issue and provided the effective answer to all US critics of Indo-US nuclear deal. India has been recognised as a responsible nuclear state with advanced nuclear technology while Pakistan has not been so recognised by the international community. This is the crux of the issue and no amount of propagandist attacks on India can alter this fact. There are only three non-signatories to the NPT — Israel, India and Pakistan. Israel is not in need of civil nuclear energy. Therefore, when it is argued that the NSG waiver for India will damage the NPT, the critics are only advocating the cause of Pakistan even while professing to make out a general case to save the NPT. The Pakistani delegate evidently thinks that South Asia is an island continent like Australia and there are no countries in it other than India and Pakistan. India has a longer border with China than with Pakistan. While the Indo-Pakistan ratios in terms of population, GDP, industrial and agricultural productions are seven to one, the two neighbours, China and India are more approximately balanced in terms of population and resources. While Pakistan argues that its security considerations should have overriding priority, it does not appear to extend that logic to its neighbour. Since President Bush cited the different history of Pakistan as the justification for not extending to Pakistan the civil-nuclear cooperation, it is necessary to focus on that history. Pakistran is the unique case where nuclear weapon development and deployment have been exclusively in the hands of the military. Even in North Korea, the Communist Party commands the weapon. Whenever Pakistan had civilian governments, the nuclear weapon development and deployment were outside the jurisdiction of the head of the civilian government. The Pakistani Army has not only a history of repeatedly seizing power from elected democratic governments, it has also a history of one of the largest genocides committed after World War II in Bangladesh. This has been recorded in the report of Justice Hamidur Rahman Commission set up by the Pakistan government itself. Pakistan set up the infamous Taliban regime in Afghanistan which had to be removed as it supported the terrorist organisation Al Qaeda which plotted and executed the 9/11 terrorist attack on the US. On February 3, 2010, US Director of National Intelligence Dennis Blair told the Senate, “Pakistan’s conviction that militant groups are strategically useful to counter India are not only hampering the fight against terrorism but also helping Al Qaeda sustain its safe haven…Islamabad’s strategic approach risks helping Al Qaeda sustain its safe haven because some groups supported by Pakistan provide assistance to Al Qaeda…Islamabad’s conviction that militant groups are an important part of its strategic arsenal to counter India’s military and economic advantages will continue to limit Pakistan’s incentive to pursue an across-the-board effort against extremism.” He added, “despite robust Pakistani military operations against extremists that directly challenge Pakistani government authority, Afghan Taliban, Al Qaeda, and Pakistani militant groups continue to use Pakistan as a safe haven for organising, training and planning attacks against the United States and our allies in Afghanistan, India and Europe…However, it still judges it does not need to confront groups that do not threaten it directly and maintains historical support to the Taliban,” providing the assessment reflecting the views of 16 intelligence agencies, including the Central Intelligence Agency and the Federal Bureau of Investigation (FBI). Does the Pakistani delegate believe that his country which has been accused of helping and abetting the Taliban fighting the forces of the European Union countries in Afghanistan has any credibility to persuade the international community that it is not a state supporting terrorism but a responsible state? The Pakistani Army under General Musharraf charged the Metallurgist Dr A.Q. Khan of having proliferated nuclear weapon technology to Iran, North Korea and Libya and he confessed to it in public on national TV. Now he has been exonerated by the Pakistani judiciary and he accuses that the confession was obtained by coercion and the proliferation took place with the knowledge and approval of the Generals and one of them even made money out of it. Pakistan refuses to allow access to A.Q.Khan by the International Atomic Energy Agency. With this unique record of nuclear irresponsibility, Pakistan expects that it should be treated on a par with India and its fairytales will be credible to the international community. India’s recent successful test of a 22-metre long heavy motor can be graded as number three in the world. In fact, India has gone ahead of China in this particular aspect. This achievement will give a phillip to India’s space programme and build capacity of placing heavier version of satellites weighing four tonnes or more in the orbit projected through a 200-tonne solid propellent. Two S-200 will hug the core liquid stage of the GSLV Mark-111 rocket, which will itself be propelled by a cryogenic engine (which is a great achievement for India as the US-led technological denial regime had denied India this capability for more than two decades). The other country with these capabilities of two heavy motors is NASA’s booster rocket of its heavy space shuttle Ariane-5 space launch vehicles. Heavier payloads of the category of four tonnes will give multi-role capabilities to the satellite and make their operations more versatile. This will enable more efficient utilisation for civil application (and even military option). Although, India’s space programmes are strictly based on civilian application on the Eisenhower Model of the 1950s. However, with the recent Chinese test of ASAT Weapons, India may have to revise its policy to build defensive systems in space. Over and above this, in a future scenario where solar energy can be tapped through space, such heavy platforms can become very useful. Further,thinking on the other end of the spectrum, can India in combination with China create an Asian alliance and form the Asian Space Station like the ISS? Can this big Idea become feasible, to prove that the 21st century is Asia’s century? Militarily speaking, these heavy satellites in combination with nano or microsatellites can become a deadly military configuration. These duel use satellites will usher space power groupings akin to the existing global nuclear order. In other words, if India has to stay as an influencing power in future, then it will have to showcase its space-based capabilities, which in a way is bound to become the power index. Yesterday’s nuclear P-5 s are bound to transcend to similar space power groupings like S-6 or 8. Latest reports of an EMP threat from space are yet another area of worry and that too from non-state actors. There are other many weapon system, which may take shape. All these will require bigger payloads satellite and India can build on these technological successes. But this mandates a space security blue print of growth and India is already late in formulating one so as to enable cost-effective duel-use application. Here one can quote the pioneering work done by the IDSA-Pugwash Committee Report ,which was published about a year back and which has laid out some concrete recommendations, which need urgent attention by the government. The recommendations state that there is an urgent need for India to formulate a space security policy with elements of creating an institutional structure for its implementation. The space policy should include the requirements of the defence services and civil agencies like broadcasting services, meteorology etc. The aspect of R&D, space laws and commercial business development needs to be factored in. The government may consider setting up a “national space security command” to meet operational needs of various agencies. India needs to identify critical duel-use technologies and become self-reliant in them (technologies like sensors, satellite hardening, counter-space nano and micro-satellite, sub-orbital flights etc.) Human resources (10,000 scientists) have to be trained and thus the same be facilitated by the government. In addition the government’s international negotiating strategy must be proactive and flexible. International cooperation on space issues should be given high priority as it builds the soft power of a nation. For instance, India should consider international cooperation with SAARC and other developing countries and give them benefits in space. The end result of an assertive India in space will add to India’s comprehensive growth and power in the comity of nations as a responsible nation. The government and the media should take note of this urgent requirement. Though defence expenditure is up almost 10%, it is still only 2.5% of GDP. The Defence budget for 2010-11 was pegged at Rs 147,344 crore, up 8 per cent from the revised estimates of Rs 136,264 crore and four per cent from the budget estimates of Rs 141,703 crore in 2009-10. The armed forces will thus get around Rs 11,000 crore extra in 2010-11. Of the allocation, Rs 60,000 crore would go for capital expenditure – purchase of equipment – by the three services: Army, Navy and Air Force. The difference between last year’s budget estimates and revised estimates for capital expenditure was because the three services were unable to utilise the allocated amount, this was returned. This year, Rs 7,000 crore was returned unutilised by the three services. The budget estimate for capital expenditure for defence last year was Rs 54, 824 crore. The revised estimate was Rs 47, 824 crore. The armed forces have long argued that with defence inflation upwards of 10 per cent, capital outlays have to increase by over 10 per cent annually. This has taken place this year, when the increase is close to 30 per cent. This year, revenue expenditure for the three services went down marginally, because payments on account of the 6th Pay Commission need not be made. For all three services, the revenue expenditure – payments towards pay and allowances – amounted to Rs 87,344 crore in 2010-11. Although last year the budgeted amount was Rs 81,288 crore, this amount went up to Rs 88,440 crore in the revised estimates. As the payments have been made, the revenue expenditure is less this year. Last year, the government had provided a steep hike of 34 per cent for the defence services, working out to an increase of Rs 36,103 crore. The allocation continues to hover at a little over 2.5 per cent of the gross domestic product, though there have been suggestions to increase it substantially in view of the security situation. Most of India's neighbours allocate a higher proportion of GDP to defence. Unlike the epic Mahabharata, the Indian Army’s lead tanks named after legendary warriors ‘Arjun’ and ‘Bhishma’ will coexist and will be deployed in different battle arenas in the future. At present, a “deployment” trials are being conducted in the deserts of Rajasthan, where 14 of the home-grown Arjun tanks face the Russian origin T-90 - christened Bhishma - by the Indian Army. The Indian Army is likely to order more Arjun tanks rather than depend entirely on the Russian tanks, sources said. The chief of the Defence Research and Development Organisation, Dr VK Saraswat, says: “We are expecting a repeat order of the Arjun tanks in the near future”. Separately, sources said two more regiments - some 124 tanks - of the Arjun series are likely to be inducted. An announcement is likely after the “deployment” trials are over. Saraswat clarified the comparative evaluation referred to in media reports was nothing but a trial of the tank’s role. “It is a process to identify the role the tank will play and will not be comparative between the two tanks,” he added. The Indian Army had ordered two regiments of the Arjun but had then showed reluctance to accept more. The trials will show the true picture. Commanders of the Indian Army, who in the past have been critical of the Arjun, have slowly come around and now say that the two tanks are of different classes and cannot be compared with each other. The Arjun at 58.5-tonne is much heavier than the 46.5 tonne T-90. But with more powerful engines the Arjun moves faster than the T-90. It is ideal for deployment in the arid Rajasthan-Gujarat sector facing Pakistan. The Arjun has better and latest systems on board. It has better transmission system than the T-90, accurate firepower while on the move. The Arjun has better thermal imaging capability, enabling it night vision. The night vision capability of T-90 is of lower category. 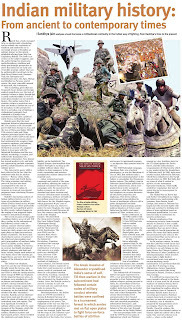 It malfunctions in the heat of Rajasthan, says an in-house input of the Indian Army. The Army plans to have 1,650 T-90s in the next few years. The production has been localised and the first tanks built in India rolled out a few months ago. 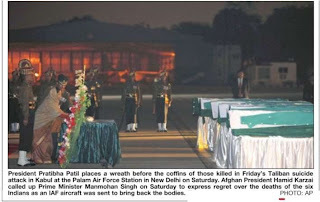 President Pratibha Patil received the bodies of Indians, who were killed in a terror attack in Kabul, here today. She also paid tributes to the victims and spoke to their relatives. 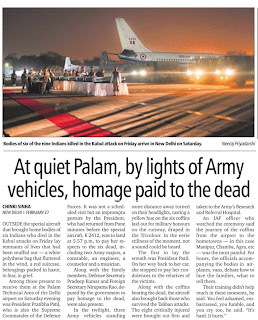 The President, who had arrived from Pune in the afternoon, just stayed on at the Palam airport’s technical area and waited for an hour for the IAF Boeing that was carrying the bodies to arrive from Kabul. Originally, the plane, which was sent to Kabul this morning, was scheduled to return at around 3.30 pm. But it got delayed due to bad weather there and reached at around 6:30 pm. This was an hour after the President, who took an impromptu decision to stay on, landed. Normally, the President, who is the supreme commander of the armed forces, does not receive bodies of terror attack victims. Patil paid homages to the victims, including two Army officers, an ITBP jawan, an MEA staffer, an engineer and a cultural artiste, at the technical area of the airport. Separately, Afghanistan President Hamid Karzai today called Prime MInister Manmohan Singh promised a full investigation into the attack. The PM asked Karzai to ensure security of Indian nationals in Afghanistan. The two leaders agreed to stay in touch with each other, a statement of the government said. His plan to tie the nuptial knot “after coming back from a foreign assignment” remained unfulfilled as yesterday’s strike by Talibans killed Major Dr Laishram Jotin Singh of the Indian Army’s Medical Corps along with five other compatriots in a Kabul locality. Friends and relatives back in his home state Manipur were shocked at hearing the news of untimely death of Major Dr Jotin’s Singh, who hailed from Nambol in Bishnupur district of Manipur. Born to a middle-class family of L Markando Singh, an employee of the Agriculture Department in Manipur, the Jotin Singh was very popular among his classmates at Manipur Public School as well as the Regional Institute of Medical Sciences (RIMS), Imphal. “We were classmates at Manipur Public School (MPS) as well as the RIMS. We passed out of MPS in 1990 and MBBS from the RIMS in 1996. Jotin then went to do a diploma course in sports medicine at Patiala. He was a soft-spoken person and used to crack jokes to keep everybody in good humour. Everybody used to like him. He was a good football player and a very sincere student throughout his career. 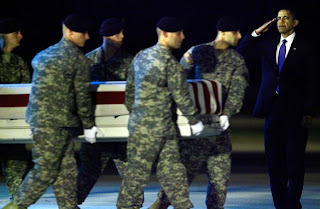 It is a great personal loss for me,” said Dr Nelson, a batch mate of the slain Major. Dr Nelson, who now serves as a doctor in the RIMS, said he met Major Jotin while he was posted with 57 Mountain Division of the Army at Agartala in Tripura. “During our last meeting at Agartala two years ago, Major Jotin told me that he would get married once he comes back from a foreign assignment,” Dr Nelson said. The Home Ministry will focus sharply on building infrastructure for central paramilitary forces and the prestigious Crime and Criminal Tracking Network System (CCTNS). The government allocated a sum of Rs 37,136.07 crore for the Home Ministry as against Rs 33,809.86 crore in 2009-10, showing a hike of 10 per cent or Rs 3327 crore hike. A major chunk - Rs 29,940 crore - will go to central forces that are involved in internal security duties as well as policing the senstive borders with China, Pakistan, Bangladesh and Nepal. A provision of Rs 444 crore has been made for a housing project for Central paramilitary forces. Another 875 crore have been set aside for creating buildings for the central paramilitray forces. This takes away a major portion of the Rs 3327 crore hike. Notably the proposals for Intelligence Bureau include Rs 15 crore under the plan outlay, while another Rs 764.37 under the non-plan outlay. The budgetary provisions come up to Rs 779.37 crore which is 15.14 per cent less compared to Rs 918.03 crore in the last fiscal. A special proposal of recruiting 2,000 youth belonging to Jammu and Kashmir to the five central para military forces-CRPF, BSF, ITBP, SSB and CISF-has been cleared. The Special protection Group which is responsible for security of VVIPS has been given Rs 252 crore up from Rs 211 crore last year. An amount of Rs 1,975.82 crore has been set aside for providing assistance to the states for security-related expenditures. I visited India for the first time just recently to speak at the Asian Security Conference, which is held annually by the Institute of Defence Studies and Analyses (IDSA), a think tank based in New Delhi. Whenever I am invited to visit a foreign country, I take the opportunity to meet with officials at military academies. On my most recent trip, I paid a visit to India's National Defence Academy -- located 250 kilometers southeast of Mumbai on the outskirts of Pune City -- with Professor Fumio Ota, who is in charge of international exchange at the National Defense Academy of Japan (NDA). Traditionally, countries with military academies kept separate schools for army and navy training. Japan and India were the first to establish integrated military academies after World War II. Today, such countries as Canada, Australia, Singapore and the Netherlands are moving toward a similar set-up. I have been impressed by the environment and facilities of all the military academies I've visited abroad. I am proud, too, of our campus environment at scenic Obaradai Hill overlooking the ocean beyond Kannonzaki, and the education we offer at the NDA. But my visit to the academy in India -- established under the leadership of Jawaharlal Nehru, the first post-independence prime minister of India -- was mind-blowing. With 50 times the area of our school, the campus was set up like a planned city with regal architecture built to match the vast natural environment. Land-based, off-shore, and aviation training can all be conducted on campus in its mountains and forests, lake and bay, and airport, respectively. We have 70 students from other Asian countries studying, training and living together at the NDA. But surprisingly enough, none of these students are from China or India. So on my visit to Pune, Indian National Defence Academy administrators and I agreed to mutually extend invitations to international conferences that we host, and to discuss a possible semester-long cadet exchange program. Back at the international conference in New Delhi, I got the impression that up-and-coming India is highly proactive on the intellectual-exchange front. With eloquent speakers from such countries as the U.S., China, Russia, and the U.K., the conference buzzed with energy. Apparently, this was not the case a few years back. It was clear that the parallel rise of China and India was creating the excitement. China and India, who are continuing to grow at a rapid pace, recorded an exceptional 8 percent growth during last year's worldwide economic crisis, mostly through domestic consumption. As is widely known, China's GDP is on its way to surpassing that of Japan, which it now matches. India's is now about one-fourth of that of Japan and China. That may not seem like much, but the figure is now greater than those of Australia and South Korea, meaning that India has the third largest GDP in Asia and is still growing. The conference debated scenarios for Asia in 2030. All the speakers agreed that China and India will be the main actors in Asia 20 years from now. Some predicted a bipolar regime in Asia between superpowers China and India, while others argued that China will become the dominant superpower. A major point of contention among discussants became whether the world at that point would lean toward antagonistic power politics or a cooperative interdependence. Warnings against a hegemonic power structure were commonly voiced during discussions about China. While Japan expressed concern over China's military expansion -- which is outpacing the country's economic growth, India expressed even more unease. China obtains 70 percent of the fuel it consumes through the Indian Ocean, but is trying to secure more fuel rights by promoting and cooperating in coastal development in surrounding areas such as Myanmar, Cocos Island, Bangladesh, Sri Lanka and Pakistan. This effort is causing alarm in the region. It goes without saying that there will be other major Asian actors besides China and India; I spoke about Japan's role in Asian security, while a Russian professor touched upon a trilateral order involving China, India and Russia. But the main focus was on the issue of U.S. presence. Hegemonic, bilateral and trilateral scenarios all exclude U.S. involvement. But what became clear through our discussions was that the absence of the U.S. was something for which not one of the conference participants wished. Princeton University professor Aaron Friedberg offered four different scenarios in which the U.S. remains a major actor: U.S. hegemony (out of the question); joint control by the U.S. and China (difficult, because of conflicting interests and mutual distrust); trilateral U.S.-China-India order (trilateral orders are usually unstable); and a dual-group order in which the U.S. and China would lead the maritime nations (Japan, South Korea, Indonesia, Australia, etc.) and the continental nations (North Korea, Central Asia, Pakistan, Myanmar, etc.). IDS associate fellow Anamrata Goswami suggested that both antagonistic and cooperative futures were possible, depending on whether China becomes a responsible actor or is driven to nationalism, hegemonism, and the use of force to claim control over Taiwan. Meanwhile, Princeton University professor G. John Ikenberry pointed out the main features of the transformations taking place in Asia, such as the rise of China and India and the normalization of Japan (the latter supported by the participation of Japan's Self-Defense Forces in activities abroad in the 20 years since the Cold War ended). He argued that the U.S. should remain in Asia through various means including the Japan-U.S. alliance and participation in regional talks to ensure Asian stability.